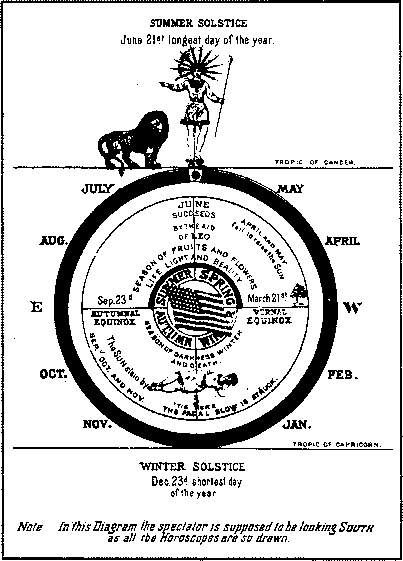 the summer solstice, exalted to the summit of the zodiacal arch (see zodiacal figure opposite page 92). Q. Are the letters surrounding the circle, with the explanation usually given of them correct? A. As the English language was not spoken at the time of the building of King Solomon's temple, either by the Hebrews or the men of Tyre, the English sentence which these letters are said to imply cannot be anything but a very modern innovation. If the circle and its accompanying letters, which Webb placed on his keystone, were borrowed from a more ancient source, he evidently did not know what their true meaning was, and so invented an explanation of his own. The degree of Master Mark Mason, or Past Master, which was confined to those who had actually presided as masters, while it furnished Webb the groundwork for his new degree, made no mention of the key-stone. It did, however, exhibit the letters H. T. S. T K. S., to which it would appear Webb added a W. and another S, for reasons of his own. It is worthy of remark that the meaning attached to these letters has varied considerably. Thus, some fifty or sixty years ago, they were explained as forming the initials of the following sentence: He That Was Slain Soared To Kindred Spirits, alluding to the legend of the death of H. A. B., as related in Oliver's Dictionary, and before quoted at length. Were Seven Steps To King Solomon's House; or, Knights Templars Should Sacredly Watch The Holy Sepulchre; and thus until our ingenuity or patience is exhausted. And it is also equally evident that all methods of reading these letters, which are founded on the idea that they are in any way initials of English words, must be wrong if the emblem is ancient, and can only be right if it is of quite recent and wholly English or American origin. If, therefore, these letters are of ancient origin, as arranged in this emblem, we may be quite certain that their real meaning has been entirely lost. If they have any ancient meaning, proper investigation and study might, no doubt, rediscover it; but, as we have no evidence whatever that they are ancient, it is not worth while to make any attempt in that direction. The legend of the loss of the key-stone and its recovery may, however, be brought into harmony with the principal legend of the third degree, and that of the Royal Arch, and thus astronomically explained. All the legends of Freemasonry relating to the finding of that which was lost, refer to the eure-sis, or discovery, by finding of the sun-god, whose death formed the story of the ceremony of the initiation into the Mysteries. The key-stone is an astronomical emblem of the sun at the summer solstice, or summit of the Royal Arch, after leaving which he is slain, and his body lost among the wintry signs. The astronomical hieroglyph of the sun ©, which is marked on the key-stone, makes this solar allusion of its loss and recovery perfectly apparent. It may, therefore, be considered as but another allegory of the loss of the sun during the winter months, and his discovery again at the vernal equinox. And, as the name of O. G. M. H. A. B. means the sun, as before explained, the astronomical sign of the sun © on the keystone is equivalent to his name being there to mark or designate the stone as appertaining to him. Q. What is the meaning of the masonic legend of the "lost word"? The mystical history of Freemasonry informs us that there once existed a WORD of surpassing value, and claiming a profound veneration; that this word was known to the few, and that it was at length lost, and that a temporary substitute for it was adopted. Cabalists, "as the very heavens shook, and the angels themselves were filled with terror and astonishment when this tremendous word was pronounced." "master's word" in a very different sense from that of the adepts of former times. In former and less enlightened times the possession of the true name of God and its proper pronunciation, or some substitute for it, authorized by divine command, were even supposed requisite in order to worship him aright; for it was ignorantly thought that, if God was not addressed by how own proper name, he would not attend to the call, nor even know what the prayers of his worshipers were really addressed to him, and not to Baal, Osiris, or Jupiter; or, if knowing, would indignantly reject them. In the East, to address even an earthly potentate by any other than his own proper, high, and ceremonious title, was considered both irreverent and insulting. Among the Jews, however, the pronunciation of the true name was supposed to be followed by such tremendous effects that a substitute, for which they believed they had the divine sanction, was enjoined. 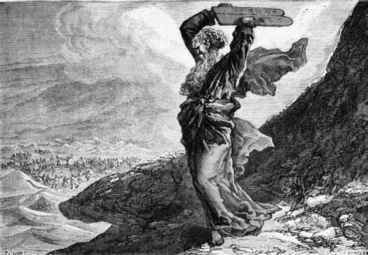 Accordingly, we find in the Old Testament that, whenever the name of God occurs, the substitute is used instead of the true name. The word substituted is generally "Adonai, " or Lord, unless the name follows that word, and then "Elohim" is used; as, "Adonai Elohim," meaning, Lord God. From this long continued use of a substitute for the real word, the latter, or at least its correct pronunciation, was thought to be lost. A trace of all this is found in our ritual, and, perhaps, furnishes the true reason why a substitute (as Dr. Mackey informs us in the extract we have quoted above from his "Symbolism" was adopted. It will be of no use to trace any further the numerous superstitions and legends in relation to this fabled "grand omnific word." Dr. Mackey very justly says in the work before mentioned, that it is "no matter what this word was, or how it was lost," for we now know that no word can be at present of any use to a mason, except to serve as a "pass-word," to prove his right to the honors and benefits of some particular masonic body or degree; and for that purpose (apart from consider ations of a purely archaeological and historical nature, one word is just as good as another, so long as it is appropriate to the time and place, and has been established for that purpose, either by ancient usages or some competent authority. 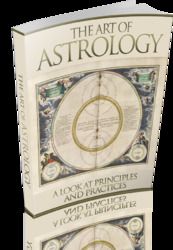 Much learning, however, as might be expected, together with persistent search, laborious study, and even the practice of magical arts, have been employed in the past ages, and even down to within a few years, to discover the ancient wonder working word by those who believed in its fabled power, or from a motive of historical curiosity desired to obtain it. According to some the sacred Tetragrammaton, or four lettered name of God in Hebrew, incorrectly pronounced Jehovah, was the true word. Others thought that the Hebrew word Jah, the Chaldaic Bul or Bell, or the Egyptian ON or OM, the Hindu AUM, together with various combinations of them all, constituted the "grand omnific word." But as the possession of no one of them, nor any possible combination of them, seems to confer any miraculous powers on the possessor, neither of them can be the correct one according to ancient traditions. If there ever was such thing as a "grand omnific word" (that is, all-powerful word, from omnificus all-creating), it certainly remains lost to this day, and "I fear it is for ever lost," for certainly none of the words disclosed, with so much solemn ceremony, in certain masonic degrees, confer any supernatural powers on those to whom they are communicated. Q. What astronomical allusion has the ancient legend of the "lost word," as illustrated in the masonic ceremonies? Enoch, under the inspiration of the Most High, built a secret temple underground, consisting of nine vaults, or arches, situated perpendicularly under each other. A triangular plate of gold, each side of which was a cubit long, and enriched with precious stones, was fixed to a stone of agate of the same form. On this plate of gold was engraved the "word," or true-name of God; and this was placed on a cubical stone, and deposited in the ninth or lowest arch. In consequence of the deluge, all knowledge of this secret temple was lost, together with the sacred and ineffable or unutterable name, or ages. The lost word was subsequently found in this long-forgotten subterranean temple by David, when digging the foundations for the temple, afterward built by Solomon his son. Other versions of this legend ascribe the building of the underground temple, and the deposit therein of the "word," to Solomon, and its discovery to those "who dug the foundations of the second temple on the same spot, and connect it with the 'substitute ark' deposited in the same place." Both legends, however, agree in stating that the "word" was buried deep underground, and in the ninth arch, or lowest of them all; that it was lost, and remained "buried in darkness" until it was subsequently found and brought to light. toward the region of darkness. From Cancer he descends to Leo, from Leo to Virgo, from Virgo to Libra, and so on until Capricorn is reached, which is the ninth sign from the vernal equinox, and the undermost of one of the zodiac, correspond ing to the ninth or lowest arch of the secret vault, and there on the 21st of December, at his lowest declination, at the winter solstice, he is lost, and "lies buried in darkness," until, reviving, he commences his ascent toward the vernal equinox, and begins by his more potent rays to rebuild that glorious temple of light and beauty, adorned by flowers and fruits, which the rude assaults of winter have destroyed. Another allegorical correspondence is found in the fact that the discovery of the word is made according to the masonic legend, by "three," which agrees perfectly with the number of sings, Aquarius, Pisces, and Aries, and the months January, February, and March, which separate the winter solstice from the vernal equinox, when, according to the legend of Hiram, the sun is found, as before explained.